My 11 year-old son and I recently had a discussion about consistency. The conversation, which began as a pep talk, concluded with the importance of building good habits. 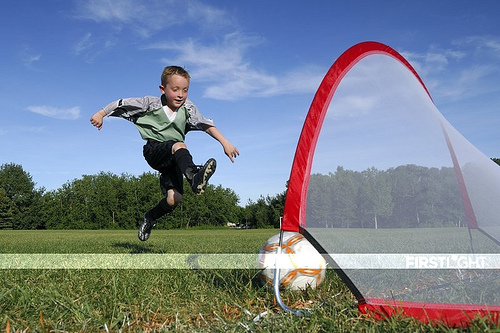 Specifically, to get better at soccer, one needs to practice regularly. He nodded his head in agreement and promised to do better. The very next day, Darius went outside and worked systematically on his soccer drills. In preparation, he created a chart with the drills listed down the page and his achievements running horizontally. I was very pleased to see that our conversation was well received. On the second and third day, following his promising start, he returned to his old ways and did nothing. When I asked him why he hadn't continued practicing, he explained that his mother wanted to work with him. Since she didn't initiate the practice, he didn't do it. Immediately, I told him that his mother was not trying to get better at soccer, he was. Therefore, he shouldn't wait for someone else to participate before he does what he knows is right. At that moment, I recognized a kink in my own armor. Here I was trying to educate him on the value of consistency and I, in my own life, failed to practice the very lesson I purport to teach. Take for example, the dissertation, which I haven't touched in weeks. How might I lecture him on something I haven't yet mastered? Oh, the paradox of parenting. Isn't it grand? Realizing my own flaws, I am not a hopeless case. In fact, there are some areas of my life where I am very consistent. The question is how does one correct consistency problems? Identify: Create a list of areas where you are least consistent. Typically, a brainstorming session will produce a large number of items to choose from. Prioritize: Place weak areas into a priority order. This means the most important areas come first and the least important fall toward the end. Select Only Three: Trying to fix everything at once is not productive. Pick no more than three areas and focus entirely on them. Adjust Your Schedule: Making time to be consistent begins with putting it in writing. This means devoting time each day to work on weak areas. Review: Decide how often you would like to review your progress. For me, once a week is a perfect time to check results and make changes, as needed. Being consistent is not always easy. However, when done right it can make the difference between success and failure. What say you? How do you handle consistency issues in your life?